The past three + years I’d become one with my camera, a Canon PowerShot G5. The manual is dog-eared, very dog eared. I learned about depth-of-field. I learned about shutter speed. I bought a flash for it. I bought a camera bag. I had home-made gels. I audited several of Nate’s courses and got to spend time in the awesome photo lab at University of Colorado-Denver. I listened to photography podcasts and checked out recommended books from my library. I had reached a point where I could visualize an image and – every once in a while – make it happen. Then the LCD screen broke, the beginning of October during the beautiful country wedding of Nate’s childhood friend. In spite of Rick handing over his pocket point-and-shoot, I have felt very handicapped. The experts told me my camera was ‘antique’ and I should do some consumer shopping. What?! I wanted My Camera! Besides, the camera of my dreams wasn’t in the budget. I ordered a new LCD screen, which Rick – bless his heart – attempted to install. It broke during that attempt. :::sigh::: It had reached the old car point; does one spend more money to fix it or wait until one can afford a new one. I decided to wait until I could afford the camera I really want. A (used) Canon 40D. I’d work on composition in the meantime and be grateful Rick handed his camera over. One day as I was cursing my knee and that little camera, attempting to snap the shutter, a light bulb went on. I remembered Julie saying something to me a couple of years ago. “I should have you teach me how to use my camera. I have one just like that and I cannot use it.” She had a small point-and-shot when we met in Seward. It was nothing like My Camera. Did she still have that camera like mine? Yes! It arrived Friday. I feel like a kid that believes in Santa Claus on Christmas morning! I was grinning from ear to ear that night. It’s a little older model than My Camera. Some of the bells and whistles are in a slightly different place. 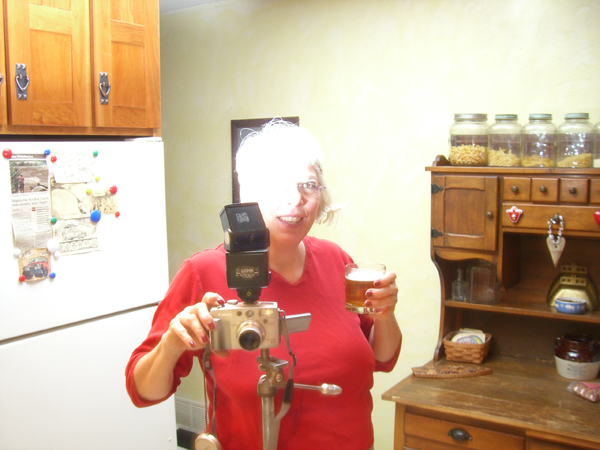 Julie had complained about the photos being fuzzy. I poured myself an IPA and started to play. Soon it felt almost like My Camera. I started by checking the fuzzy photo problem. I waited for the camera to focus before pressing the shutter all the way down. No fuzzy photos. 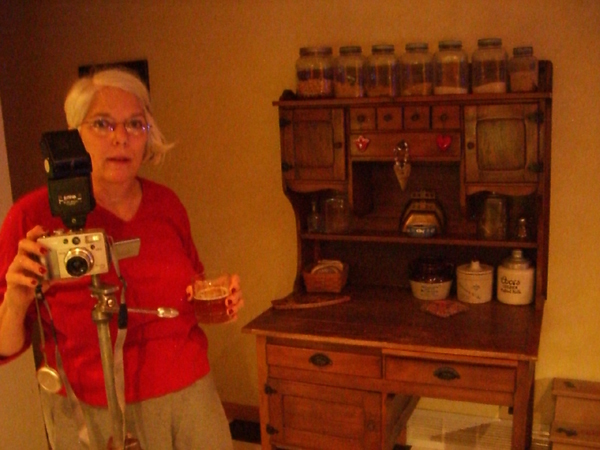 I set the camera on the tripod and attached the flash to the hot-shoe. It worked! Rick! Take a picture of me for Julie! I am so happy! Thanks Julie! You’re the best!